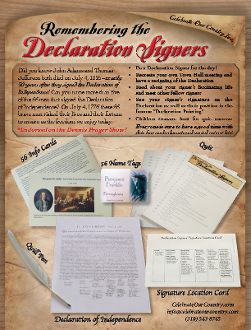 Our 'Remembering The Declaration Signers Theme Kit' includes: • a 58 question history quiz for the children; • a Declaration of Independence signature placement chart (so you can find whose signature is where); • 56 nametags, for the fifty-six Founding Fathers; • 50 exciting Founding Father information cards, with picture and location arrow (see below); • 1 copy of the Declaration of Independence; • 1 Quill pen and vellum overlay sheet, to facilitate your "Re-signing of the Declaration of Independence" This fun Theme Kit allows you and your guests to experience the 4th of July like never before!! The party becomes a commemorative celebration of the men who signed the Declaration of Independence. This theme starts off as a social mixer, progressing to be an exciting, worthwhile learning experience for adults and for children of all ages. Additional highlights of your day will be an exciting "Town Hall Meeting," culminating with a "Re-Signing of the Declaration of Independence" with a QUILL PEN! Your 4th of July celebration will be the talk of the town -- while bringing awareness of the sacrifices that the Signers had to make to create this beautiful country we live in.